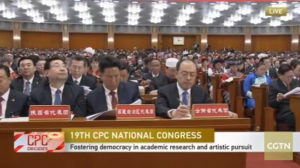 Lobsang Gyaltsen (second from right), who was just promoted as a full member of the Party Central Committee, reading Xi Jinping’s work report at the Party Congress on October 18. While we await expectantly for the new lineup of the Chinese leadership after the 19th Party Congress that might happen on October 24, 2017, it might be worth our while to talk about some other issues related to the meeting; the Tibetan delegates, for instance. 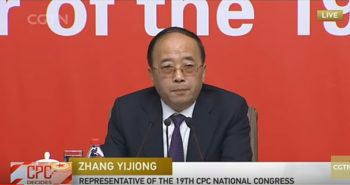 China’s official media said there are 33 Tibetan delegates to this Party Congress: 17 are from the Tibet Autonomous Region (with seven being female), five from the Tibetan region that is now Qinghai, three from the Tibetan area now in Sichuan, and one each from the Tibetan areas in Yunnan and Gansu. Additionally, there are three Tibetans from the PLA contingent, out of which two are female. Then there is one from central party organs, departments directly under the Party Central Committee, while another one is from national state institutions. This makes the total 32. 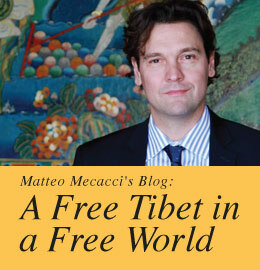 At the time of writing, I am not able to account for the remaining one Tibetan, if the total number is in fact 33. Most probably, he could be Wangchen Tseten, who is listed as a Mongolian, from the Qinghai Tibetan Medicine Hospital. 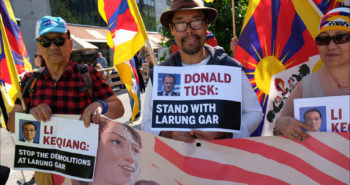 As an aside, there are two delegates from TAR, who are listed as being Monpa and Lhopa, both within the broader Tibetan family. Among the Tibetan delegates, majority of them are officials at different administrative levels; a few provincial level officials from Lhasa; a governor from Kanlho Prefecture; a vice governor of Sichuan Province whose name is written as Yao Sidan, but is actually Dorjee Rapten; and a few prefectural level party secretaries from Qinghai. There is a gynecologist from Ngari and a teacher from Lhasa. Two among the Tibetan delegates have met envoys of H.H. the Dalai Lama during the 2002-2010 round of discussions. Che Dhala (Qi Zhala), currently governor of TAR, was governor of Dechen Prefecture in Yunnan when the envoys visited Gyalthang (Zhongdian/Shangrila) in 2003 and Penpa Tashi (currently a vice governor of TAR) participated in the talks between envoys of the Dalai Lama and Chinese officials in Guilin in 2006. Incidentally, there are two people named Penpa Tashi who are delegates to the 19th Party Congress. As to how the delegates were chosen, Chinese officials were at pains to stress, “…that the election was a competitive one”. (Xinhua: Delegates to Party congress highly representative, October 17, 2017) There are limitations to elections in China, but any election would be better than no election, one might say. But the same Xinhua report has this additional information,”… except Tibet and Xinjiang, which had been approved to exercise non-competitive election.” Darn! I thought the Tibetans in Tibet would have had a taste of electoral campaigns, something those of us in diaspora are familiar. Even as these Tibetan delegates are being used to glorify Chinese rule in Tibet, reality about the situation in Tibet comes out in different ways. The fact that the Chinese authorities closed the Tibet Autonomous Region to foreign visitors for the duration of the Party Congress is an indication of the volatile nature of the situation there. Or, if the situation there is not that bad then a case can be made that interest groups within the Chinese Government that do not want a more liberal atmosphere in Tibet are taking the opportunity to create a scene for a more hardline approach. Similarly, even though China claims that Tibetans have greatly improved their livelihood under Chinese rule (Namsa Lawok Tabui Phogyur “Transformation as if the sky and the earth have changed places” is how they put it), there is unintentional admission of the state of affairs. In a Xinhua report on October 17, 2017 meant to brag about how a Tibetan has changed his life for the better under China (An Entrepreneur and his dream of poverty alleviation in Tibet), a reference is made to the hometown of the now well-endowed Paljor Lhundup. Xinhua says, “Although Penjolondru’s life has vastly improved since his humble beginnings, his hometown is still stricken by poverty.” (Italics mine) The Xinhua report continues, “Located at about 4,500 meters above the sea level, Lhunposhol Village in Nakartse has a population of 6,640, 25 percent of whom live in poverty. There is little arable land and villagers depend on livestock raising for living.” (Italics mine) I guess life in Tibet is not totally rosy after all! Be that as it may, how have Tibetans fared in terms of presence in the organizational aspect of the 19th Party Congress? Obviously, since no Tibetan is on the Politburo, no Tibetan finds a place in the most important 42-member Standing Committee members of the presidium (composed of the 24 incumbent Politburo members as well as retired members) that oversees the Congress proceedings. 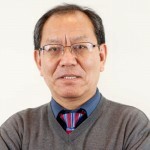 However, in the presidium of the Congress, consisting of 243 members, there are two Tibetans: Jampa Phuntsok (currently a Vice Chairman of the National People’s Congress) and Che Dalha. Also, Lobsang Gyaltsen finds a place in the 22-member delegate credentials committee, which, as its name suggests, examines the delegates’ qualifications. Anyway, by this time next week, we will know how many Tibetans find a place on the 19th Party leadership roll. Until then we will have no choice but to go with the flow in terms of this political meeting with Chinese characteristics that is called the 19th Communist Party of China National Congress. Please keep us informed. Very nice post and thank you. Tibet 24/7 will share this post.